We are now an accredited Yale door master expert. We can be found on their website. Please click here to find out more. The first thing to mention is that, if you are having difficulty locking your uPVC door lock, phone us straight away, as we are a upvc locksmith specialist. We can usually adjust the door or lock and prevent any more damage being done to your door mechanism. This obviously prevents you from having to buy a new one and so saves you money. If you leave it and the problem isn’t rectified, you may well break the gearbox on your door mechanism, resulting in you needing it replaced. Which can cost more in the long term. If your double glazing door or double glazing door lock is already broken, it is normally one of two things. Either the mechanism is faulty or your cylinder is faulty. You can tell which it is quite easily. If the problem seems to be with the key turning incorrectly, then it is likely to be a faulty Cylinder. If the problem seems to be with the handle, then it is most likely due to a broken door mechanism. This is the bigger of the two jobs, and a larger expense. If it’s a problem with the cylinder, we will be able to fix the problem straight away, in one visit. 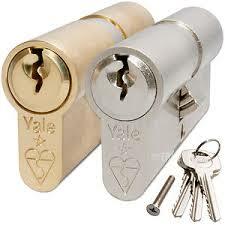 Yale High Security Cylinder Locks. If it’s a problem with the uPVC door lock mechanism, we will open it for you and replace it. 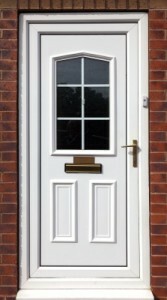 We can usually have a new mechanism on your door and working within two hours of arriving. Always call Locks in the City as we are a Upvc Locksmith specialist. It’s worth mentioning about uPVC door security and the extra security which can be installed. You have the option of changing your current cylinder lock for an anti snap, bump resistant and anti drill cylinder lock version. Handles can be replaced for more secure, anti snap upvc door handles. We can also install sash jammers.These are essentially door bolts for uPVC doors. For extra security on a your sliding patio door, you can fit push locks. These stop the door from being both lifted off the runners or jemmied open.